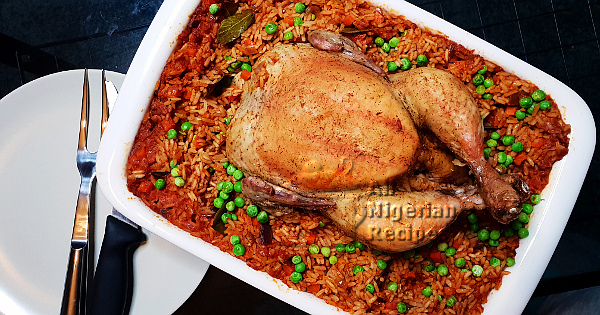 This recipe is simply the classic Jollof Rice cooked inside the belly of whole chicken. It's a different way to serve Jollof Rice this festive season. 3 cubes Chicken oil (optional), see video below. The seasonings listed above are my favourites when preparing chicken. Feel free to add your favourite seasonings and herbs. I always use male chicken which is the soft chicken when making whole chicken recipes because it cooks faster than the hen. If you do not have chicken oil, use any of the following: vegetable oil, sunflower oil, olive oil. Clean the chicken thoroughly with water. Grind the seasoning cubes, thyme, black pepper, onion powder and curry powder with a spice grinder to form a powder. Rub this powder all over the chicken and inside the chicken. Cover and keep in the fridge to marinate for at least 30 minutes. Scrape the carrots. Dice the onion and carrots as shown in the video below. Add the chicken oil to the frying pan. When it heats up, sautee the diced carrots and onions for about 5 minutes. Put the parboiled rice in a pot. Add the sauteed carrots and onions, tomato stew and the remaining seasoning powder. Pour water to same level as the rice and stir very well. Scoop some of the rice into the inside of the chicken. When full, tie it up with a food safe twine. 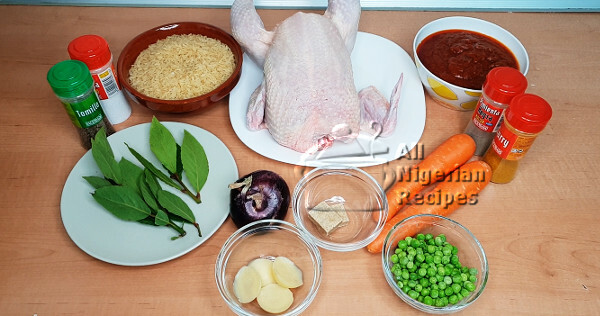 Scoop the remaining rice into a baking dish (casserol dish) and place the stuffed chicken into the well of rice. See video below. Stick the bay leaves into the rice in strategic positions. Cover with a foil to prevent the rice from drying out. Leave the chicken exposed. See the video below to see how I did mine. Bake in a preheated oven at 200 dec C (400F) till the chicken is well cooked. I usually bake for 20 minutes then afterwards bake for 1 hour per kilogram of chicken. The chicken I used weighed 2kg (4.4 lbs) so I baked for 20 minutes then baked for 2 hours more. That is a total of 2 hours 20 minutes. If you wants yours very brown and golden, bake for much longer. I prefer mine just cooked and moist like boiled chicken. When done, add the green peas on top of the rice, stir the top a bit and bake for 5 more minutes. That's it! See also: Roasted Whole Chicken.